A properly installed and configured wireless mesh network is an invaluable source of useful geotechnical data within any hard rock mine. This network allows for simple and rapid collection of data from instruments like extensometers, contractometers, instrumented cable bolts, ground movement monitors and sloughmeters that have been fitted into the walls and roof of the underground mine. Collection and proper analysis of relevant data can alert hard rock mine engineers to situations that pose a potential danger to mine personnel and equipment (e.g. rock falls and tunnel collapses). 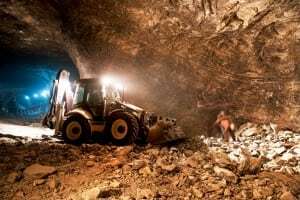 By fitting vulnerable tunnel and cavern walls and roofs, as well as some open rock face areas, with geotechnical instruments, mine engineers can work out solutions to some of the most common mining risk situations. In a typical wireless mesh network, instruments are connected (up to three at a time) to small, rugged and self-powered wireless nodes (e.g. the MDT-RTU). Each node then communicates wirelessly with one or more other nodes that are within range. In this way, the data coming from the various instruments can be easily boosted over substantial distances without the need for supporting electrical or network cabling within the tunnels. Once the data reaches the nearest network gateway, it will be fed into the mine’s existing LAN (Ethernet) network. This makes the data easily accessible to mine engineers above ground for analysis and interpretation. The analyzed data can then be used to determine where potentially risky situations are developing. Mining operations can then be stopped, and personnel evacuated if necessary, until the danger has been reduced or eliminated. In most cases, there is little or no need for engineering personnel to go underground and check, as the instruments can be accurately monitored from the mine offices, or even off-site if a cloud-based application forms part of the supporting software installation.